Savory, Just the right amount of spice and Crowd-pleasing! We love a good vegetarian chili but it does require a fair amount of chopping and cooking for the seasonings to all come together, so it’s not a come home from work and whip up type of meal… Instead we love to make it over the weekend and, over the years it’s become a New Year’s Day tradition to make a big warming pot of it. We have the time and it is a perfect dish whether we are entertaining friends or nesting at home and gearing up for the week. This Vegetable Chili adapted from the Silver Palate Good Times Cookbook is a long time favorite. It’s packed with goodness, perfectly seasoned a total crowd pleaser. 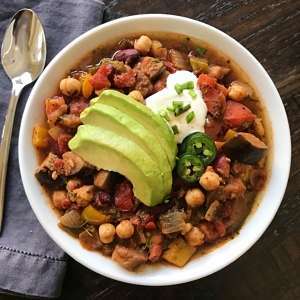 It has lots of veggies- eggplant, onions, tomatoes, green peppers, two types of beans — dark kidney beans and chickpeas, and lots of fresh and dried spices including chili powder, cumin, oregano, basil, pepper, salt, fennel seeds, fresh italian parsley, fresh dill and fresh lemon juice. Serve as is or top with avocado, sour cream, cheese, scallions or even jalapeños if you want some extra kick. Sometimes we serve it over brown rice as well if we want something extra hearty. Best part, this recipe makes a really large quantity so you can enjoy it today and then freeze it for one or two other days. We usually have enough for 3 meals. A long time favorite, this hearty vegetarian chili is packed with goodness and a total crowd pleaser. It's loaded with veggies, beans and fresh & dried spices, and perfectly seasoned. Recipe adapted from The Silver Palate. Serve as is or with rice and any combination of toppings -- avocado, cheese, sour cream or jalapeño for some extra kick. Place eggplant in a colander and sprinkle with salt. Let stand for 30 minutes while you prep the other ingredients. In a large Dutch Oven or extra large sauce pan*, heat ¼ cup olive oil over medium heat. Add eggplant and saute until tender, about 15-20 minutes. Add more oil of necessary. Remove from heat and set aside when tender. *This will be the pan you make the chili in. Simultaneously, in a large skillet, heat remaining ¼ cup olive oil and saute onions, garlic and peppers until soft, about 15 minutes. Add to the Dutch Oven or extra large sauce pan with the eggplant. Heat the Dutch Oven over low heat and add canned tomatoes with liquid, fresh tomatoes, chili powder, cumin, oregano, basil, pepper, salt, fennel and parsley. Cook uncovered for 30 minutes, stirring frequently. Stir in kidney beans, chickpeas, dill and lemon juice. Cook another 15 minutes. Stir well, taste and adjust seasonings if desired. Serve warm as is or with any combination of the following: brown rice, shredded cheese, avocado, sour cream and jalapeños. Freezes well. Store in air tight glass containers, leaving some room at the top as soup expands when it freezes.